If you want to create running totals in DAX, you usually use date-based functions like TOTALYTD. However, what happens if your figures aren't calendar-related? In this example we'll create a DAX measure to calculate the figures in the 4th column. If you want to try this out yourself, import this Excel file into a new Power BI Desktop model. I've included the Cumulative column in the Excel workbook as a check - obviously we'll just be recalculating something which is already there! Create a new measure in the imported data table. See under a separate heading below for an explanation of what this does! The table shows the cumulative total imported from the Excel sheet alongside the measure we've just created. Reassuringly, they give the same numbers! 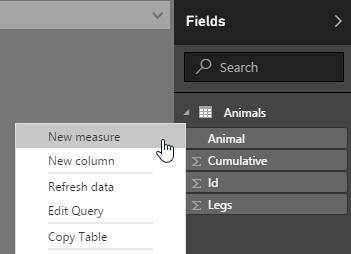 Be careful when creating this table to summarise by the Id or Cumulative columns, otherwise Power BI Desktop will add them together. I've added some formatting to jazz the table up a bit. 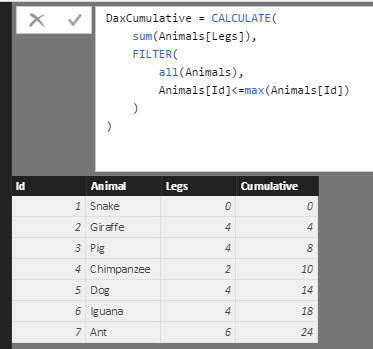 The formula works out the total number of legs for the filter context, which would normally be for the animal currently being listed (Dog), giving 4. The default filter context for a calculation. The FILTER function initially says to use all of the animals, and not just the one for the current filter context. The rows considered to get the cumulative total for the Dog row. DAX aficionados will be pleased to hear that you could also solve this problem using the much-harder-to-understand EARLIER function.